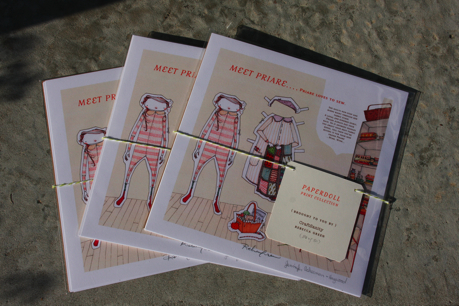 The CraftSanity Paper Doll Print Collection! 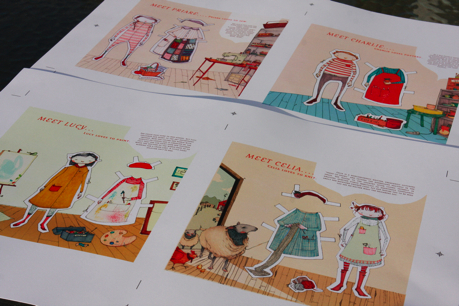 When I started CraftSanity Magazine more than a year ago, I knew I wanted to print a collection of paper dolls with artistic and crafty themes. Since fine art illustration is not my strong suit, I recruited Rebecca Green, a local artist and illustrator, to make this a reality. To create a doll for each issue we chatted about what medium the doll would be working in and then Rebecca would head off to her Grand Rapids studio do her awesome thing. Within days a beautifully illustrated doll would pop up in my inbox along with a name. From there, I studied each doll on my computer screen and typed up the stories they whispered to me between projects. Priare the quilter, Celia the knitter, Lucy the painter and Charlie the potter are members of the doll family that Rebecca and I created in the hope that these fun characters would add a bit of whimsy to your life. There are snippets of Rebecca and me in these dolls and the rest came to us from somewhere out in the creative universe. For CraftSanity Magainze issue 5, Rebecca and I moved on to an illustrated embroidery project. (See pages 24 and 25.) But we didn’t want to just forget about Priare, Celia, Lucy and Charlie. 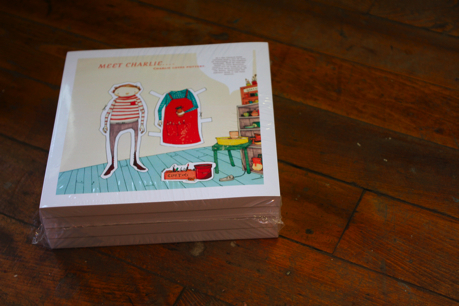 So we pooled our funds and printed 50 limited edition sets of 4 prints on archival paper. They’re ready to frame and a bit whimsical an inspiring, too. If you’re interested in snagging a fancy numbered set of prints to collect or frame and gift to crafty friends this holiday season, you can find them here. Look around your community and consider the artists and writers you admire and imagine what might happen if you where to join creative forces someday. Collaborate, my friends. Collaborate! And if you do, be sure to tell me your story. I want to hear all about it. fantastic issues altogether, you simply received a new reader. What would you suggest in regards to your post that you simply made some days ago? Any sure? You have some really good posts and I feel I would be a good asset. I’d absolutely love to write some content for your blog in exchange for a link back to mine. Please send me an e-mail if interested. Thank you!